Robert Paterson’s The Book of Goddesses is not a new release (2011), but it only recently came to my attention. In a nutshell, I LOVE IT! Paterson received the Composer of The Year Award from the Classical Recording Foundation for the album, which is gorgeous both inside and out. 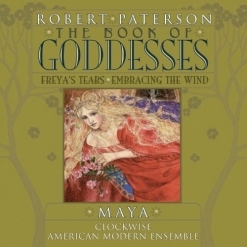 MAYA, a flute, harp, and percussion ensemble, had commissioned Paterson to compose a piece for them, and he thought their instrumentation would work well in a multi-movement composition about goddesses. While researching the subject, Paterson discovered a book about goddesses written and illustrated by Kris Waldherr, who agreed to design the the CD booklet. The booklet contains beautiful illustrations for each of the pieces, stories about the goddesses, and Paterson’s comments about each work. It also contains bios of the composer, illustrator, and musicians. All of this is encased in a gold-foil cover! It’s a very impressive package, and we haven’t even talked about the music yet! The album is actually in three parts. The nine-movement “The Book of Goddesses” is performed by MAYA (Sato Moughalian on a variety of flutes, Jacqueline Kerrod on harp and John Hadfield on percussion); “Freya’s Tears” is a three-movement work for violin and harp and is performed by Clockwise (Marc Uys on violin and Kerrod on harp); and “Embracing the Wind” is performed by American Modern Ensemble (Moughalian on flute and alto flute, Danielle Farina on viola, and Kerrod on harp). 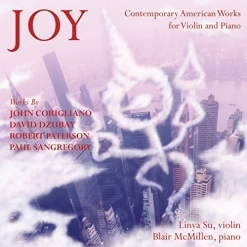 The music is exotic, accessible and very beautiful as it reflects on the universal scope of the goddesses as well as the various cultures they represent and the characteristics of each goddess. 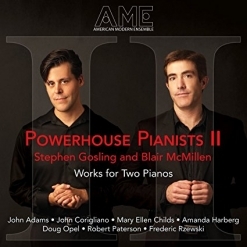 While the album is categorized as “classical,” it really is difficult to limit it to one genre. There are world, new age, and jazz elements as well, making it a unique and very enjoyable listening experience. The piece titled “The Book of Goddesses” includes one movement each for Sarasvati, Xi Wang Mu, Aphrodite, Brigit, Estsanatlehi, Xochiquetzal, Oya, Yemaya, and the Muses. Rather than focusing on the goddesses of one culture, Paterson created this music by fusing his own sound world with the styles of music from India, China, Greece, Ireland, North America, Nigeria and Cuba. By using non-western scales, the instruments used take on the characteristics of music from the regions they are emulating. Paterson’s selection of goddesses was inspired by those who evoke something musical, dance-related, or sensual. The pieces are hypnotic and have a quiet energy that can become very habit-forming! “Freya’s Tears” is something of a companion piece since it was inspired by three more goddesses: Iris, Freya, and Sekhmet. The viola and harp are especially poignant in the title movement, as Freya weeps tears of gold while searching for her lost husband. “Embracing the Wind” was originally inspired by the image of an Olympic athlete running against the wind, and gradually evolved to a more abstract idea of creating music that sounds flexible and has wind-like ebb-and-flow qualities. At more than 9 1/2 minutes, the piece has time to tell its own story which is often quite visual, sometimes minimal and abstract, and sometimes dramatic. It’s a fascinating close to a truly exceptional work of art. The Book of Goddesses is available from Amazon and iTunes. Very highly recommended!